When Cullen arrives at his lover Lois's home she tells him her husband is planning to kill her for her money. While he was at the airport on a business trip she had found his hidden gun but as they speak the husband sneaks through the back door intent on carrying out his plan. She confronts him; the gun in her hand goes off and he falls dead. Then ... Cullen is a homicide lieutenant. Does he arrest her? No way, not in the noir world, instead he decides on a cover-up. They load the body in his car and he drives off to dump it at the airport, then known as San Francisco Municipal Airport, a logical place given that he was supposed to be there. (Coincidentally, this same terminal was also seen a year earlier in the movie Impact). ... in 1942 ... this vintage photo gives us a better view of the terminal. It was built in the 1940s and served passengers until the mid 1950s when a new terminal, named Central Terminal, was built nearby. ... and Now, Central Terminal was later renamed Terminal 2 and expanded over the years to the current structure shown below (map). The original terminal above was torn down in the 1980s. 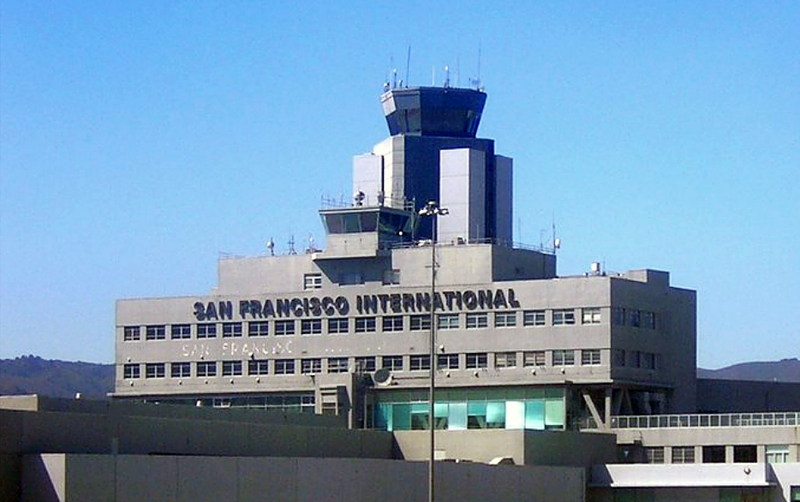 San Francisco Municipal Airport was renamed San Francisco International Airport in 1955. Cullen deposits the corpse at the airport and takes off, unfortunately for him witnessed by a couple in a parked car. ... and Now, these north-bound booths (map) have been removed. The south-bound are still there, retaining art deco design, but the toll-collectors were displaced in 2013 by FasTrak sensors. Then ... Later in the movie we get another, daytime, view of the toll booths. ... and Now, there's still a clock mounted in the center. Cullen pulls over on the bridge (today's traffic wouldn't allow that) and throws the gun over the railing, into the bay. Now he feels better; with no weapon any investigation will be severely hobbled.